We have laid down more stringent than normal environmental criteria for our production plant. We put great emphasis on research and development work, with the result that our activity is both efficient and environmentally friendly. The recycled product biogas that we produce is derived from organic waste that is a renewable, domestic energy source. • Thanks to a processing system for Biological odour emission gases, the odour intensity of our plant falls well below the permitted maximum. While the maximum emission level for foul smelling gas is set at 2500 OU/m³ (odour units), LABIO´s production plant reaches a level of only 500 OU/m³. • Due to the chosen dry decay technology the plant does not produce any process waste that is a burden to the environment or difficult to purify. The wastewater produced is channeled to Lahti Aqua´s treatment plant for purification. The cleaning system for odorous gases. The steam emitted from the chimney is purified air. Our customers have the opportunity to raise the recoverability level of their waste, while also reducing their carbon footprints. In addition to delivering their bio-waste to the LABIO plant for treatment an enterprise can take advantage of the biogas produced by Labio and use it as an energy source. 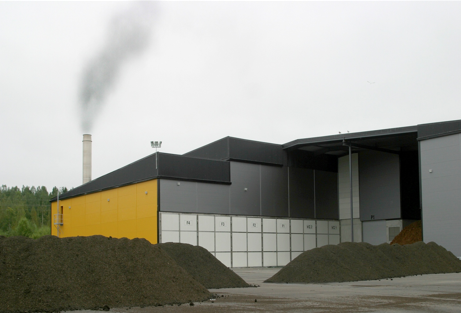 Biogas from recycled materials is delivered via the Gasum gas network under the name Omaenergia (your own energy). Environmental permits: LABIO Oy possesses environmental permit no. 86/2014/1, Code ESAVI/179/04.08/2012 for the treatment of all kinds of bio-material available on the market, as well as for sludge. Plant approval: LABIO Oy has according to by-product decree (EY)1774/2002 the plant approval of the Finnish Food Safety Authority -Evira (approval no. FIC3-002/762/2004). According to the only European plant permit in accordance with the animal by-product directive hygiene requirements; 12mm, 70 °C, 1h. The plant can treat class 3. by-products from animals. The plant also treats animal manure (CL2) and intestine contents (CL2). The plant can process raw meat from shops and wholesalers, as well as fish and packed poultry.